I have a secret knitter confession to make. I don't like knitting socks. At all. I've knit 3 pairs for my boyfriend, who wears them in the winter. I haven't even finished knitting one pair of socks for myself. 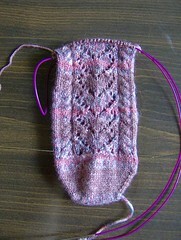 That single, lonely sock I started at least two years ago is languishing on the needles. Maybe it's the aftermath of Hurricane Sandy, but I find that all I want to do is knit fingerless gloves. That's right, fingerless gloves. I like how I can customize them to fit me and my unusual hands. No matter what I do, I can't find store bought gloves that fit me well. If they're small enough for my fingers, they're too narrow for my hands. If they're wide enough for my hands, they're way too big on my fingers. Apparently, I'm even an odd size in sterile gloves, x-small which is the least frequently ordered glove size according to our lab supplies rep. But with fingerless gloves, I can circumvent the whole issue of sizing. They're surprizingly warm to boot. I dug out a pair I started last year, after the Yarn Harlot started a trend with the silk mawata gloves. Any gloves recommended by a native Canadian must be warm, I thought. So I went out and bought some hankies from The Painted Tiger, who has some fantastic colorways. I got the flame colorway, which is half red and half yellow, which has made some burningly bright stripes. I'm loving it. I have no idea why I ever put it down a year ago. I slipped them on to see how much more I wanted to knit before doing the thumb opening, and holy cow! She wasn't kidding, they are warm. Hopefully I'll get them done before another year is out and I can have more insulation against the wintry winds hustling in the new season with frigid abandon. It's been brought to my attention that the photos are down in my blog. I'll be hunting around for another place to host my blog photos, but until then, I ask for your continued patience. I hope to pick a photo host by the end of the weekend. Thanks! So, this question was raised on Ravelry about whether or not the cast-on row counts as the first knitted row. I answered with the classic, "It Depends." Long-tail cast-on and all of its cousins counts as a first row, or so I'd been told. For the record, tubular cast-on also counts as a first row. Other cast-ons, like knitted, backwards loop, cable, and provisional, do not count as the first row. It's all about how you cast-on. Being who I am, a lab geek, I had to know The Truth. So I grabbed my new camera (Thank you, Sean!!! ), a bunch of DPN's, and some yarn. I proceeded to cast-on. Starting on this little adventure, I hypothesized that a backwards loop cast on would create the same effect as a long-tail cast on. I was wrong. It actually creates the same cast on as German twisted cast on! I was rather surprised. Don't believe me? I took pics! That's your basic backwards loop cast-on, with the next loop ready to slip on the needle. Pay attention to the frayed end of yarn, that's going to be our identifier for the backwards loop needle in these series of pictures. After I cast on 8 stitches, I proceeded to turn and knit the row. Sorry, that was the best of the bunch of pictures I took of the first knitted row with the backwards loop cast-on. I was rather surpized that it didn't look like a long-tail cast-on, but couldn't shake the feeling that it looked hauntingly familiar. So I started a German twisted cast-on. Please note, the frayed end of yarn. We'll be following its progress. I was rather surprised at how similar they looked. As a matter of fact, I had to use the frayed end of yarn to identify which needle was which cast-on method. After staring at them closely for several minutes, I could see a few differences. The first stitch in the backwards loop cast-on had a looser base than the slip-knot I used for the first stitch in the German twisted cast-on. Other than that, they were practically identical. I won't comment on tension, because I was purposefully knitting everything very loosely to make sure I could photograph the stitch definition. But here's a comparison highlighting how the stitches are formed. Remember that German twisted cast on is on the top, and backwards loop is on the bottom. The stitches are formed the same way, despite going about it in a very different manner. After staring at the stitches for so long, I understood why the backwards loop cast-on didn't create a long-tail cast-on. When I knit the row of backwards loop cast-on, I twisted the loop as I knit it, creating that extra twist seen in the highlights. Of course, I couldn't stop there. What cast-on would create the same base as long-tail? Believe it or not, it's this one. I've never used this cast-on in my life. I'd heard about it, heard how fiddly it was, and pretty much cursed the 5 stitches I knit into it. For the sake of my sanity, I used a slip knot to make and hold the first stitch. Otherwise, the yarn just cheerfully unwrapped itself from the needle, thereby undoing all my hard work in trying to cast it on. Once that was done, I proceeded to knit into the first few loops. There it was! Long-tail cast-on in the most obnoxious way I could imagine attempting to create it. It's the stitches on the bottom, with the second needle shown on how I knit each stitch. Long-tail cast-on is on the top needle, pinned in places so you can see how the loops go. I won't ever be using that cast on again, I will cheerfully use long-tail instead. There were a few subtle differences between the cast-on methods. The direction of twist was different - if you'll look carefully, the loops that form the base twist in different ways. I'm sure if I went back and wrapped the yarn the opposite way around the needle, I'd get the exact same loops as long-tail cast-on. So, yeah, if you use long-tail cast-on or any of its cousins, you will get 1 knitted row after you cast on. In the grand scheme of things, it doesn't really matter, because when you look at row gauge - we're only talking about ONE ROW. One row at the cast-on edge of a sweater will not make a difference. I went and grabbed the knitting gauge off of the Hey, Teach! sweater, a popular pattern to put things in perspective. It's 24 rows for 4 inches, or 6 rows to 1 inch. 1 row = 1/6th or 17% of one inch. Yeah. Not that big a deal. But, if you're like me and a little OCD is actually a successful career trait, then it's just nice to know. So, I've been excited about this new lightbox that I got to help me take better pictures of my handspun and items for the etsy shop. This lightbox that I got came as a set with lights, which was really cool. Except, they had short cords, so I needed to use extension cords to plug them in. No problem, I'd just dash into the basement and grab some extension cords so I could photograph the new handspun I'd just finished. My yarn would be completely safe inside the lightbox for the 5 seconds I left it unguarded to go get the cords. Or so I thought. In the 5 seconds it took me to dash down the staircase, grab 2 extension cords, and dash back up into the dining area where I'd set up my little studio on the dining room table, Penny had made herself completely at home on my precious hand-spun yarn. It was really hard to get mad at her, she was purring. I can't fault her taste in yarn. I'm glad to know she thought it was soft enough to cushion her little cat nap. As it was, she made good photography practice. She did, however, eventually get tired of the paparazzi bulbs going off in her face constantly, and abandoned her yarny cat bed. My handspun laceweight from Fiberoptic Yarns. I love, love, LOVE her fibers. The gradients, like this one, tend to sell like hotcakes online. What you see is 2 braids, 4 oz each, of the 80% merino, 20% silk gradients in the Indigo to Emerald colorway. I spun about 1200 yds of laceweight. In my head, it's destined to become a shawl, but more on that later. It's funny, I realized I went about the knitting learning curve all backwards. I could NOT stand the boring repetition of stockinette stitch, or garter stitch, or ribbing, or any of the other very repetitive projects that are so frequently recommended for a new knitter. I made a large square and then asked my friend if I could knit branching out. That's right, my second knit project ever was a lace scarf. I think my third one was a tank top with a lace panel. I loved lace from the get go - the challenge and repetition was soothing and meditative to me. Of course, I completely disregarded important things like gauge and swatching and size. All those things are taken care of in blocking with lace! Now, I'm eating humble pie and going back to making sure I understand the basics. Sure, I can wing it and adapt a lace pattern to make a cardigan. But I wouldn't be able to tell another person how in the hell I modified the rate of increases to deal with a top-down raglan while maintaining the stitch pattern. I find stockinette stitch soothing now, because I don't have to look at what I'm doing. Plain cardigans are my favorite thing to knit on the exercise bike. I'm working on a plain cardigan now, called Hatty, to make myself learn those basics. Yup, I did a gauge swatch. I ripped out 4 inches of the back panel when the gauge in the seed stitch didn't match the stockinette. I changed needle size and pattern sizes to get something that I hope has a better fit. I think the biggest lesson I've learned is not to be afraid. Well, I am afraid. Afraid that I don't get the sleeve caps right. I'm afraid that I'm going to screw up the seams. I'm afraid the button bands won't line up. What I'm really learning is not to let that fear stop me from accomplishing new things. When I first started knitting, I would have never guessed that simple stitching would have so much to teach me. In case you haven't heard the rage screaming across the internet, Ms. Aloi wrote this article decrying girly girls and the downfalls of women's role models. Unfortunately, she uses far too wide of a paintbrush and falls prey to the very same sin she decries - using stereotypes to define limiting roles for women. As many other knitters, crocheters, and crafters out there can testify, the "girly girl" stereotype is anything but. This idea that knitters who strive for nothing more than domestic bliss is an absolute fallacy. I know knitters who successfully run their own business and have their doctorate degrees. I know knitters who teach martial arts. I know crocheters who have published papers. I know women who are a crack shots with a hand gun. I know women who were in the service and knit. I could go on and on with this list of anecdotal evidence of women who do not fit the stereotype, but I'd just be beating a dead horse. After the lessons of the civil rights movement, haven't we learned not to define people by a stereotype? I thought American education had that one covered by now. However, she does have one valid point - the role models portrayed on TV today. I miss strong female leads like Buffy. I love Joss Whedon's recurring theme of portraying women as saviors of the world. I staunchly reject Twilight because Bella's wishy-washy role as constant damsel-in-distress makes me long for a woman with the will to save herself. Today's media blitz of passive women makes want to turn off my TV and knit or spin instead. At least I'd have something more productive to show for my time, like say a new, tailored sweater - as opposed to knowing what happened on the latest episode whatever pointless episode Peg Aloi bemoans as the worst kind of role model for women. I have no idea what it is because I'm too busy to bother watching trash. That said, where should all that rage be productively directed? How about the Glass Ceiling? I don't care if USA Today says that it's the lowest disparity on record- it should NEVER be there in the first place! Gender shouldn't even be a factor whatsoever in a person's salary. It's been how long since the feminist movement started and we still have pay disparity? Or how about how the US supreme court threw out the gender bias suit against Walmart. Any idiot looking into the details of that case know that Walmart turned a blind eye on policies that kept women from becoming managers and climbing the corporate ladder. It's absolutely deplorable and Walmart should be forced to change their ways. These are things worth getting angry over and doing something about them. However, if there is one thing we have learned in this post-feminism era is that getting angry won't get women anywhere. It's not fair, but studies have shown that women who negotiate angrily get discredited whereas men who negotiate angrily are viewed as passionate or positive. Gender bias has grown more subtle and more insidious. This article at futurevisions.org describes quite well the limiting stereotypes that successful women face to day. These are the thing we should be bemoaning and working to change, Ms. Aloi. I made a lovely discovery while browsing around etsy the other day. The dyer who made the roving that I used to make the Firebird Shawlette is back in business! It appears that the dyer went on a short hiatus, but she's back now, with more than one lovely gradient available in her shop. The seller of whom I speak is Fiberbee She's located in New Zealand and if you're lucky enough to live in New Zealand, it's free shipping for you! If not, well, I think she charges very reasonable shipping prices internationally. I can also vouch for her fibers, having spun up her polwarth roving in Hibiscus. I've washed it several times now, and her dyes are very well set. I've had only a little bleeding come off of this fiber, even after forgetting about it and letting it soak for several hours. The polwarth was a dream to spin and deliciously soft. I wear my firebird shawl as a scarf all the time in winter. I'd definitely buy from her again! Go, check out her etsy shop, and give one of her fibers a spin. Welcome to Crazytown, where my friends have proclaimed me queen. Why did they do that you ask? For some reason, there's very little that I fear about knitting. 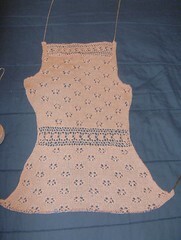 Hmm, a dress in laceweight done in lace knitting written by vogue? Sounds great! I have very few inhibitions when it comes to knitting, and that sometimes ends disasteriously. Apparently, other people think this signifies a level of crazy that only the royalty can attain. Follow along with my escapades as I dive head first into all sorts of insane techniques and projects without much more than an "Oh! That looks pretty, I can make it!" Those will probably be my famous last words. Here's a current list of what yarns with which I have used the stitch markers. Jaggerspun 2/18 silk wool blend. 50% silk, 50% wool. Pastimes by Cojoined Creations. 100% soysilk (rayon). Elann Super Kydd. 70% Super Kid Mohair, 30% Nylon. Misti Alpaca Lace. 100% alpaca. Dreamy Lace by Yarn Addict Anni. 50% alpaca, 30 % Extra Fine Merino, 20% silk. Show others some virtual love! Join Ravelry! It's my favorite knit and crochet website, and one of the best web communities out there. Check out Molecular Muse's Etsy Shop for a quirky gift. Or the perfect gift for your favorite caffeine junky. The Stone Soup Challenge - it takes a village right? See the artistic efforts of this virtual village that I've joined to support the works of other Etsy shops. Got cash to burn? Feel like picking up something unique and nice as a gift? Try a recommendation fromThe Handmade Movement. Need more temptation? Check out FiberOptic's shop. I can't say enough good things about her fibers and her yarn. Looking for something special to make? Try the free patterns at Knitting Pattern Central. I've submitted one of my patterns there, and they have a wonderful collection for both knitting and crochet.